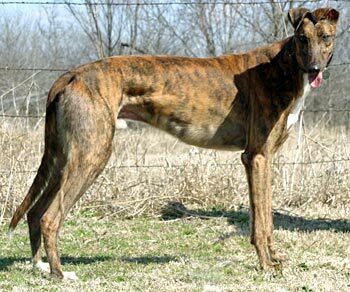 Mustang, aka JW Mustang, is a 3-year-old brindle male born January 8, 2007. His sire is Craigie Whistler, making his grand sire the late famous Molotov, and his dam is Fuzzy’s Thunder. Mustang’s racing career was all in Texas, starting July 30, 2009 at Gulf Greyhound Park in LaMarque, TX, and finishing there on December 12, 2009. 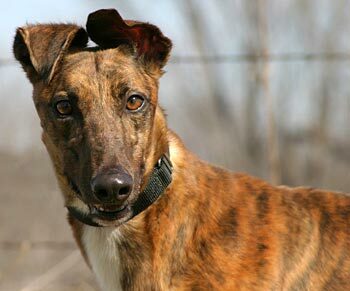 Mustang is now looking for his forever home! Mustang is not cat tolerant, but has not been tested with small animals yet. 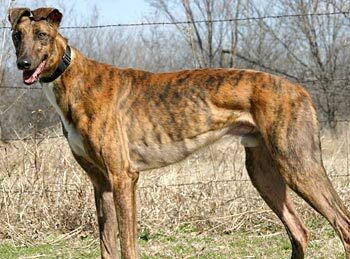 Mustang is a beautiful, 3-year-old brindle male greyhound. He has adapted very well to being an only dog in a condo environment. He's crated for about 10 hours a day and has had no accidents since the first day. He was a little reluctant to go into the crate at first, but with encouragement he goes in of his own accord. Mustang is quite a talker, rooing at me when I let him out of his crate and when we are getting ready to go outside. At night, he sleeps on a dog bed next to my bed and usually sleeps through the night. He does have some watch-dog tendencies as he will alert me if he hears anything outside. Mustang has done well when we've encountered small dogs at the complex. He does like to watch squirrels and birds and would give chase if the opportunity presented itself. Mustang loves to play with his squeaky toys, especially a green frog that is almost as big as he is. He loves to toss his toys into the air and pounce on them - it's so much fun! Mustang is learning his house manners well, which includes what items in the house are his to play with and which are not his. Mustang is well behaved, but he still has a few things to learn. He's very smart and will soon figure out all the "rules" of living in a home. Mustang is funny, friendly, and a really greyt dog. He'll be a wonderful friend for some lucky person.